Here at Sunbear Squad we’re all about being good Samaritans to animals and helping out rescues in need. Today we have a very special boy, Mojo, who needs our help. He’s a rescued Bernese Mountain Dog. As some of you may know I have a soft spot for Berners after having adopted our rescue, Logan, from the Bernese Auction Rescue Coalition. Unfortunately after a mere 14 months we lost our beautiful boy to cancer. Recently we adopted another BARC baby, Patience. She’s a great addition to the Hoefinger household. Mojo is being fostered but he needs to find a permanent home. However, most imperative is being able to get some tests done on him because he has a neurological issue that needs to be looked into. The rescue is not able to pay for the very costly test and they’re trying to raise some money so they can get him diagnosed and then find him a forever family. Mojo was seen by the vet and is appears that he does have some sort of neurological issue with his spine/rear end. We are working on trying to raise funds to have some proper test done, most likely an MRI. This is very expensive at about $3000. Sadly the rescue can not afford to spend that much on just 1 dog. If someone is willing to help by donating something towards the tests, would be very helpful. If someone is willing to adopt with these unknown diagnosis, please feel free to call us or click on the link above for a PayPal donation site for Mojo. 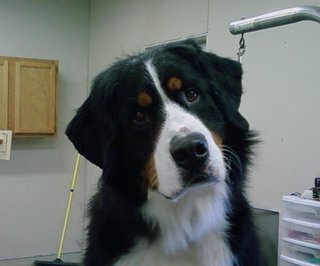 Read more about this adorable boy on the Heart Of Michigan Bernese Mountain Dog Rescue site. If anyone is looking for some good Mojo this may be the boy for you. Please post and crosspost this message.